Use these Chrome 5-J-hook Waterfall Faceout Tubes to maximize the space and usability of your gridwall! Your customers will love the look of your apparel on these faceout tubes, especially because they will be able to see every item and not just those in the front! The Chrome finish ensures a sleek look in any store, matching nearly any fixture within your retail store. All of our gridwall faceouts are in stock and available for immediate shipping. Looks and feels solid. I wanted chrome but didn't find it, but black looks good next to our chrome displays. Overall, I am pleased. Now to try it out. 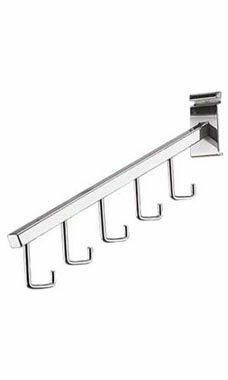 Strong, well made and durable, these hooks are great for displaying a variety of our items. We have been very impressed with the amount of weight they can hold! These make my display of purses so much better looking. Great quality and price. We find more and more uses for these!